NASA's Curiosity Mars rover drilled into a rock target called "Buckskin" on lower Mount Sharp as seen in a self-portrait which combined several images taken by Curiosity's Mars Hand Lens Imager (MAHLI) on Aug. 5, 2015. Image released Aug. 19, 2015. NASA's Curiosity rover captured a glorious selfie on Mars this month, shortly before resuming its trek up a huge Red Planet mountain. The 1-ton Curiosity rover snapped several low-angle shots with the camera at the end of its robotic arm on Aug. 5, at a site called Marias Pass in the foothills of the 3.4-mile-high (5.5 kilometers) Mount Sharp. Mission team members then stitched those photos together into the amazing selfie, which NASA released Tuesday (Aug. 18). Curiosity stayed at Marias Pass for several weeks, studying a "geological contact zone" where two different rock types come together. Curiosity's Dynamic Albedo of Neutrons (DAN) instrument measured high levels of hydrogen beneath the rover's wheels in the area, suggesting that lots of water molecules are bound to minerals in the rocks there. "The ground about 1 meter [3.3 feet] beneath the rover in this area holds three or four times as much water as the ground anywhere else Curiosity has driven during its three years on Mars," DAN principal investigator Igor Mitrofanov, of the Space Research Institute in Moscow, said in a statement. 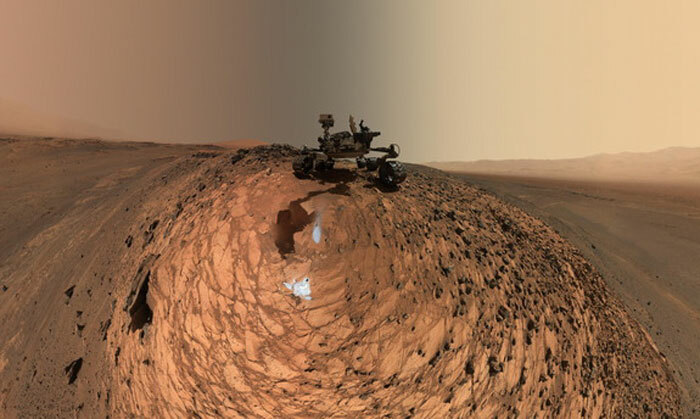 Curiosity Mars rover took a low-angle self-portrait on Aug. 5, 2015, above the "Buckskin" rock target in the "Marias Pass" area of lower Mount Sharp. Image released Aug. 19, 2015. The rover drilled into a Marias Pass rock dubbed Buckskin, collecting powdered samples for future analysis by its onboard instruments. The mission team hopes those analyses help them understand why the Marias Pass region is so "wet," NASA officials said. 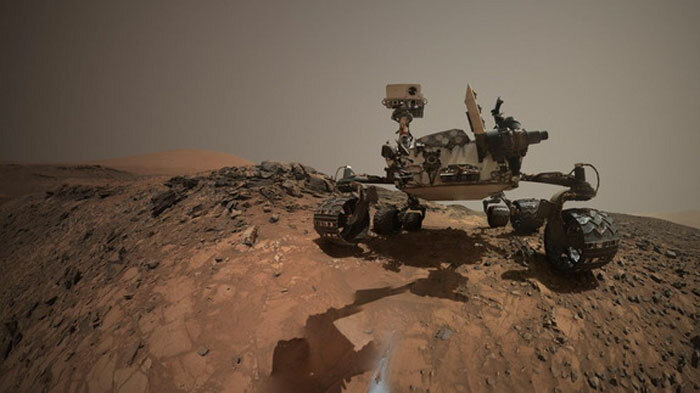 The Buckskin operations marked Curiosity's first full-on drilling work since a brief short circuit was observed in the drill's hammering percussive mechanism in February. "We were pleased to see no repeat of the short circuit during the Buckskin drilling and sample transfer," Steven Lee, deputy project manager for Curiosity at NASA's Jet Propulsion Laboratory in Pasadena, California, said in the same statement. "It could come back, but we have made changes in fault protection to continue safely drilling even in the presence of small shorts," Lee added. "We also improved drill percuss[ion] circuit telemetry to gain more diagnostic information from any future occurrences." Curiosity finished its work at Marias Pass on Aug. 12 and headed farther up Mount Sharp. (The rover reached the base of that peak in September 2014.) Mission scientists want Curiosity to climb through the mountain's lower reaches, reading a history of Mars' changing environmental conditions in the rocks as it goes. The six-wheeled robot covered 433 feet (132 meters) in drives over the past week, bringing its total distance traveled since touching down on the Red Planet in August 2012 to 6.9 miles (11.1 km), NASA officials said.